Whose attention would you most like to attract? 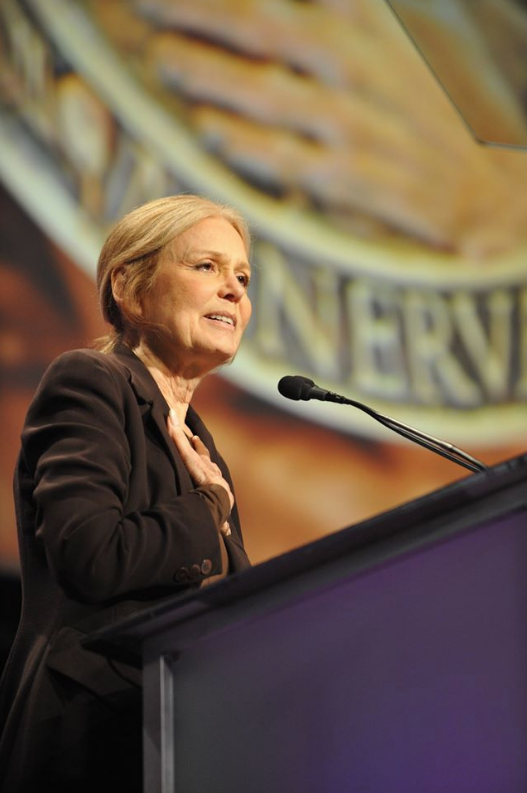 Gloria Steinem… senior bureaucrats… somebody who funds the kind of work you do? Whose attention would you most like to attract? In recent years, Canadian women writing timely, engaging and persuasive commentary have elicited responses from all of the above. Others have sparked international conversations, investigative journalism, and a reversal of government policy. I first discovered the power of op eds as a fledgling graduate student 25 years ago. I had just joined the board of Media Action in 1991 when the Miss Canada pageant was cancelled. A local TV station in BC where I lived called looking for someone to comment. Having previously worked in public relations, I knew the importance of soundbites. I marshalled my analysis into a single sentence, made more vivid by use of an analogy. After the station aired my quote, my ordinarily supportive mother called me. This was not the response I’d been hoping for. But to be fair, I was displaying my traditional winter pallor, and my 15-second clip was wedged between 15 seconds of Miss Canada 1990, and Miss Canada 1991, both of whom were a decade younger than me, sporting professional make-up and – this is important – certified beauty queens. The real value of the experience, however, was that I had a lot more to say than the 15 seconds that aired. So I channeled the rest of my critique into a written opinion piece that I submitted to the local newspaper. When they published it, I was over the moon. Emboldened by my newfound ability to command the attention of hundreds of thousands of readers in my hometown of Vancouver, I began expounding on other unfortunate trends in the media’s portrayal of women. The exposure led to more interview requests, speaking opportunities and – who knew? – eventual acceptance into the grad school program to which I’d failed to gain entry the previous year. I was intoxicated by the sense of agency this mediated access to a broader audience gave me. Making the knowledge I was acquiring at grad school more accessible to parents and teachers, media producers and policy makers was enormously satisfying. And doing so opened new doors – giving me the opportunity to write a weekly column, produce a TV series, appear on radio. A book contract, speechwriting work and a job in the premier’s office followed. What became eminently clear to me was that having a public voice made it infinitely easier to get people to return my phone calls, give money to my cause, and help me make change in areas I felt were important. This is why it’s so satisfying for me to share the skills and strategies I’ve learned with others. And since 2010, hundreds have applied the lessons to their own advocacy and knowledge dissemination efforts. And some effective strategies I’ve learned from the women who’ve participated in the workshops. Lisa Philipps made it easy for readers to understand the downside of balanced budget legislation by packaging her argument in five subheads. She received queries about her analysis from two levels of government. For her part, Catherine Connelly parlayed an op ed on temporary foreign workers into a successful research funding application. The workshops we deliver have supported hundreds of women in drawing attention to issues they know and care about, positioning themselves as authoritative go-to sources in the process. Many continue to stay in contact with us years after their workshop participation so we can share their insights on Facebook and Twitter, and through Informed Opinions’ website. On April 27th at the beautiful Verity Club in Toronto, we’ll be offering our last open Writing Compelling Commentary workshop until the fall. Spots are still available at a sliding scale rate. You can find out more information, and register here, if interested.